View recent photos and videos and updates for the two Bald Eagles - Chewey, our baby beaver, and others. Frisky's can now accept donations on our website by using PayPal! Click here (or on the graphic above) to select Frisky's Wildlife and Primate Sanctuary as your Charity. They will take care of everything from there. Vehicles can be donated from ANY location, not just Maryland. Friskys can receive a $5 bonus for your first purchase and up to 26% of your ongoing purchases when you shop at over 700 top-notch online merchants through the iGive network !! Howard C. Muller and Marguerite E. Muller Charitable Foundation, Inc. Welcome to Frisky's Wildlife and Primate Sanctuary, Inc. on-line! At Frisky's, we have 3 main spheres of service to animals. 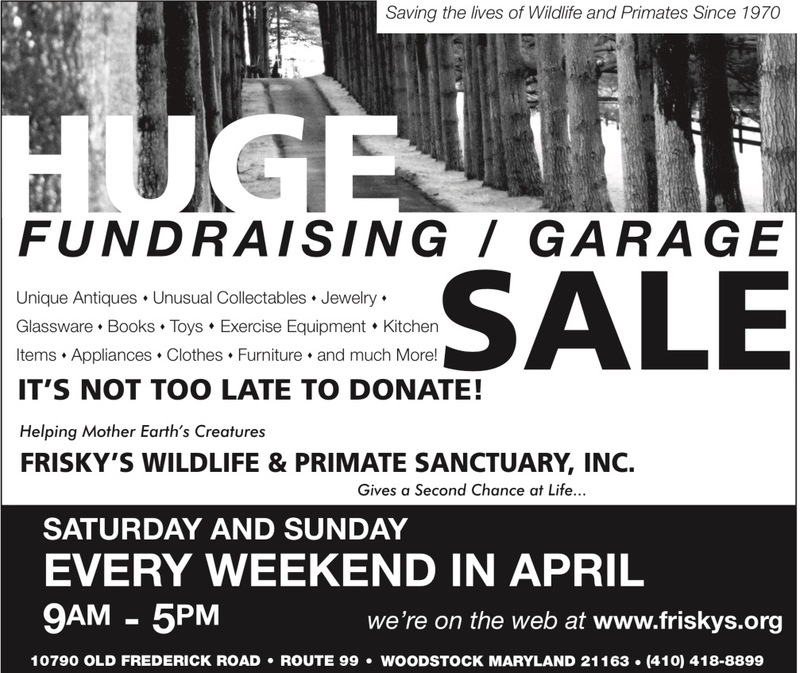 Frisky's is a non-profit Wildlife Rehabilitation center located in Howard County, MD. We take in injured, orphaned, abandoned, or displaced wildlife. If you find an injured animal in your yard or along the side of the road, you can bring it to us for rehabilitation, where the goal is to always return them back to their natural home once they are well enough or old enough. If you are not sure how to transport an injured animal, you may call us for instructions on how to get it here safely. We are a rescue center and home to Primates and other small exotics who have been kept as Pets and are no longer able to live with their owners. Monkeys are not meant to be pets, but unfortunately there are brokers who continue to sell primates even though it is illegal in many states to have a monkey as a pet. They become too difficult and demanding for most to handle and end up having to find another home. You cannot take the wild animal instincts out of a monkey. We provide a safe home with love and enrichments for those primates who end up without a home and have been imprinted by human care. These animals live the remainder of their lives at Frisky's and are never adopted out. We are sorry but Friskys NO longer accepts any domestic animals for adoptions. This includes but is not limited to: Birds, including domestic ducks and chickens, reptiles, rodents, rabbits or any other animal that can be purchased from a pet store, feed store or private person or organization. Many hours per week are spent in telephone education and consulting. 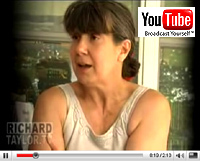 We find many people breathe a sigh of relief once they have been coached on what to do when they have a concern about wildlife in their yard. Sometimes an intervention is needed, sometimes it is not. We give people peace of mind when they know that they have done everything they could to help an animal they are concerned about. Donations can be taken directly to Friskys between 1 p.m. and 3 p.m. 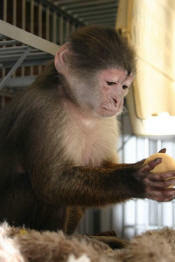 Please support Friskys Wildlife and Primate Sanctuary, Inc. The wildlife need your support. Please be patient ... photos may take several minutes to load. � 2017 All Images and Text are Copyrighted by FRISKY'S Wildlife and Primate Sanctuary.